Over 50 people gathered and loaded two buses February 18 at the Black Women’s Forum office to attend the foundation’s latest community event. 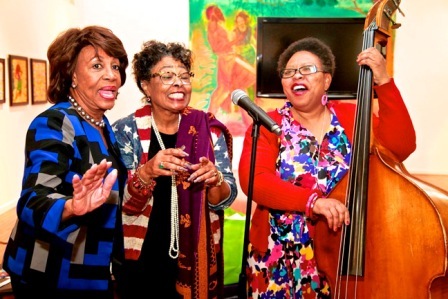 The group drove through Los Angles, visiting museums and art galleries in local and modest areas from 9:00 a.m. to 5:30 p.m. Locals, LASUD officials, journalists, friends and industry professionals, cruised through popular neighborhoods discovering underrated sceneries with Congress­woman Maxine Waters. “We have wonderful, creative activities in our own community,” Waters said. The Black Women’s Forum has been around for almost 30 years. BWF is not as active as they were in previous years, however, in 2015, the organization produced a gala and roundtable themed “Standing In The Gap” to honor mothers of slain unarmed men. Sybrina Fulton, Trayvon Martin’s mother, Michael Brown’s mother Lesley McSpadden, Ezell Ford’s mother Tritobia Ford, Eric Garner’s mother Gwen Carr and Tamir E. Rice’s mother Samaria Rice were present. “People were able to hear firsthand what they had gone through and didn't have to get sound bites from the television and newspapers,” Waters said. The Black Women’s Forum celebrated Black History Month as a special event. However, Waters hopes this year the organization will be able to return to doing luncheons every month. A Democratic U.S. Representa­tive, Waters serves California’s 43rd district. Working under multiple presidents, she continues to advocate for her community at large. Waters recently made headlines opposing Donald Trump. Last month, she authorized a bill to have Trump and his administration investigated in connection to Russia’s involvement in electing Trump and his cabinet. Waters also discussed the Republican Party’s opposition to the Affordable Healthcare Act and their repeal plan. “Obama fought very hard for ACA. Some people who have Obamacare don’t know it and they have said to some of us, ‘well I do not care about Obamacare, I have the ACA,’” said Waters. “It is being used a lot by the Right Wing, because they are out to get rid of it. We have about 32 million people who now have Obamacare and California has one of the best plans under Covered California and we are trying to hang on to it. One of the things this new president has made a part of his platform was getting rid of the Act, they do not like this, because we have subsidies in it for people who cannot afford to pay, we have small businesses who we subsidize for their employees if they cannot afford to pay, they have to come under a certain criteria. 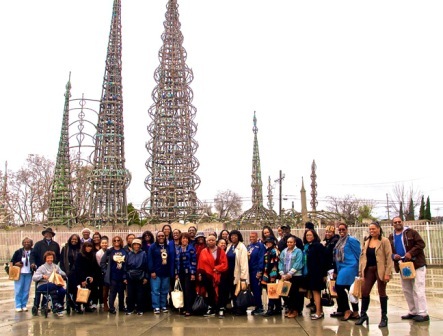 The tour included a total of five visits to urban landmarks; Watts Towers Art Center Campus (WTACC), Watts Labor Community Action Committee (WLCAC), The Creative House, Museum of African Art (MOAAA) and California African American Museum (CAAM). Waters combined visual arts with music that added to the significance and presence of Black History and made everyone feel welcomed and appreciated from museums and gallery staff, city officials to BWF attendees. Music and gifts were unlimited throughout the tour. “WTACC Director, Rosie Lee Hooks, has been there in spite of people saying it wouldn't work, no one wants to come out here to Watts Towers, to the contrary they have Jazz and Blues events every year and it is entertaining. People come from all over, outside L.A. as far as San Diego and people in our own community do not know about it,” states Waters. The WLCAC has been around for years and was founded by civil rights and union activist,Ted Watkins who was funded by the United Auto Workers (UAW) union after the Watts Riots in 1965 to see what could be done in the community to provide more services. Its been around for forty to fifty years. Watkins advocated for a community that was ignored and abandoned. He salvaged, invested and developed in a neighborhood that was failing. Keeping it in the family, The organization continues to salute Black past and current history while serving the youth to the elderly. New art gallery, The Creative House, located in Inglewood on Market street displays fresh, colorful and thought-provoking artwork that brings in new electric and hip scene to the neighborhood. Museum of African American Art is located inside of Baldwin Hills Macy’s. MOAAA gives a true meaning to ‘hidden treasure.’ Inviting and historic, the gallery is often overlooked because people do not know it’s there. MOAAA has been part of the community for over 40 years. The museum remains dedicated to honoring Black art. California African American Museum, located in Exposition Park, displays an array of provocative exhibitions that reflected modern, yet classic informative imagery. All museums and galleries are free. To plan a visit at any museum or gallery, go to www.wattstowers.us/, www.wlcac.org/, @TheCreative­HouseLA, www.maaala.org/ and www.caamuseum.org/. To reach Congresswoman Max­ine Waters visit waters.house.gov.